Recently I came across a story about an obese inmate in Houston, Texas and I just wanted to share it with you. This fat rat had apparently undergone two body searches and the prison guards had found nothing. But when it came time to take a shower the 500 pound guy not only bent over to pick up the soap but dropped the hand gun he'd hidden under his flabs of fat. Authorities charged him with possession of a firearm in a correctional facility. The incident gives new meaning to the phrase "concealed weapon". An inmate may well have inquired, "Is that a gun in the shower or are you just happy to see me?" Meanwhile, I saw another story from another prison - this one in Nashville, Tennessee - where, it seems an inmate has sued authorities for losing his prosthetic leg. Seems when he arrived at the facility a year ago the prisoner was carrying an extra leg and the guards wouldn't let him keep it with him. 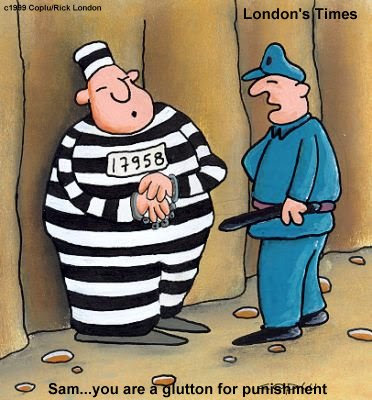 Seems now the prisoner wants it back but officials can't find it. I guess the guy was really looking forward to entering the three-legged race at the prison field day. The guy's suing for replacement costs and $500,000 in punitive damages. If you ask me he shouldn't get all hopping mad 'cause I don't think he's got a leg to stand on. Don't forget to hit up this week's caption contest. Winner announced Saturday. A few years back I had read an article about a court case where a man had stolen something. I can't remember the details, but I do remember the jist of the hearing. The defence lawyer told the judge that it was just the one had that had committed the crime and so should be the only part of the man to be punished. The judge must have thought, "sure, why not" or some such because he agreed and sentenced the man's arm to a term in jail while the rest of the man was free to do whatever. So, with that, the lawyer helped the man remove his prothsetic arm and together they walked out of the courtroom leaving the arm on the table! oops, that was supposed to be "just the one hand" not "had" sorry! Skye: That's a very disarming defence. a gun?? i woulda sneaked in some snaks! Are you pulling my rolls of fat? Erm, I mean my leg? nooter: Kibbles n Bits or Snausages? CatLady: Happy I could inspire you! 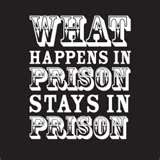 Whoever said that prison is too easy must think bunions are a snack food! Seriously, the air conditioning has to be set on 78 and the television can't be on after 10pm. What about Conan?! Now losing a leg? This has gone too far. I vote them all back to Gitmo. I read about th case of the man with the prosthetic leg. His case went to court, but the judge threw out the complaint stating the prisoner didn't have a leg to stand on. Don: Gee, Don, you speaking from personal experience? Wow, hadn't heard about that last story... I'll have to warn the Deputies where I work about THAT stashin place... yikes!